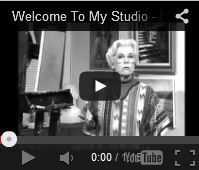 Millions recognize Helen Van Wyk as the host of PBS Television's "Welcome to my Studio" which, for many years, was a breath of fresh air on TV for artists who wanted to know more about their craft. Rather than introducing a formula for making paintings, Helen took the time to teach the reasoning behind every brush stroke and its value in reaching the goal of a finished work. I remember watching her show and being mesmerized, not by her creation of a painting, but by her absolute clarity of knowledge and her astounding ability to convey complex thoughts in a matter of a few always informal words. "Put that cast shadow right underneath that vase," she'd say. "Park it's little carcass...because without it, the vase will appear to float." Always the why. Always the reason. Always a very clear instruction. She was a note taker's dream as I found out in studying with her. She had an ability to make everything seem right. And oh yes, if you were doing something wrong, you'd hear about that, too! No foolishness allowed. "Painting isn't fun!" she would say, "It's a battle between you and that canvas as you try to turn its flat 2-dimsenionalness into a 3-dimensional being!" 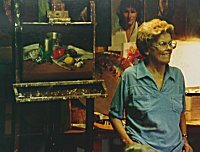 I never took any time to ask her about her life before I got to know her - first by telephone, then by studying with her at her studio and home on Massachusetts' beautiful Cape Ann. I hear she was born in Fair Lawn, New Jersey and - like me - was painting seriously by age 12. She studied with Ralph Entwistle and her biggest influence, Maxmillian Rasko - a portrait painter and teacher. Soon as she got her own "legs" as an artist she, too, was off teaching people the wonders of good technique. 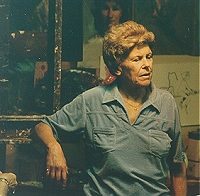 Thousands have studied with her in her painting demonstrations around the country and came away the better for it. In 1990 she began her PBS television series - the same year she was diagnosed with cancer. She continued unabated, going full tilt with television shows, demonstrations and commissioned paintings. I last saw her in Cape Ann in June of 1994. She told me the continuous release "radiation bullet" they had installed in her, as well as her continual visualization of her tumor growing smaller was, apparently working. But we all could tell she wasn't anywhere near 100%. She said she and her husband, cartoonist Herb Rogoff, had decided to spend Winter down in Florida because she couldn't take the cold Rockport winters any more. The seminar I was attending was 8 hours or more a day, 5 days a week - and on weekends she would prepare for the next one! She was not well at all, but plowed through the daily sessions with an incredible deftness, humor, and energy. She may have not felt well, but when she was standing in "her place", palette in hand, canvas at the ready, she was a tiger and a fountain of valuable information. Pin-drop silence in a room of 40 people is awe inspiring as her students learned and learned. Her classes ranged from beginners to professionals and yet everyone walked away having learned new things. This particular seminar was one in which nobody but Helen painted. Everyone, however, had to bring a painting for critique on which the artist didn't mind if Helen painted corrections while giving valuable lessons on corrections - which is what painting is: "a record of a series of corrections". This master artist divested herself of 50 years of knowledge, selfessly and with exceeding charm, an earthy humor, and with solid truth.